Balaklava was the second album by Pearls Before Swine, and their second to be released on New York’s legendary ESP, the label responsible for The Heliocentric Worlds of Sun Ra and other uncompromising free jazz recordings of the mid-1960s, as well as oddball counter-cultural rock albums by the likes of The Fugs and The Godz, to whose music I was introduced through a resounding commendation in the original Perfect Collection. 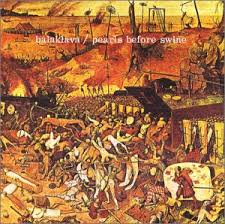 The very first time I heard the music of Pearls Before Swine I knew it was what I had been waiting for my whole life. I had a complete set of albums by The Velvet Underground, Love, The Byrds, Buffalo Springfield, Tim Buckley et al. But something was missing. I never knew what that something was until I encountered Balaklava. Pearls Before Swine were different. Once fittingly described as “a madman saint leading the asylum band during the rainy season”, Tom Rapp, the band’s leader, songwriter and only permanent member, enjoyed little popular success despite a catalogue of wonderful psych-folk albums in the late 1960s and early 1970s. Perhaps his quivering voice and heavily pronounced lisp – charmingly honest to some – provided an obstacle to commercial credibility. Or his lyrics, so rich in strange Biblical and Blakean imagery, may have alienated others. Whatever the case, success eluded the band during their career. Recognition came late – too late for pop stardom – but a quietly flourishing audience of fans including a number of musicians, resulted in a tribute album, and concert invitations began to flood in during the late 1990s, by which time Rapp was working as a Civil Rights lawyer in Florida. Their debut offering, One Nation Underground, was initially recorded as a demo and sent to ESP, who promptly signed the band and rush released the album. On first hearing, it’s Dylanesque protest folk – along with song titles like ‘Drop Out’ and tunes as immediate as ‘Uncle John’ – may seem to have captured the zeitgeist well, but the album sleeve featuring the macabre painting The Garden Of Earthly Delights by Hieronymus Bosch, hinted at something more portentous. At this stage the band had not yet ‘turned on’ – indeed Rapp identifies the strongest intoxicant favoured by the fledgling Swine to have been Winston cigarettes! Although it was the only Swine album to sell fairly well (around 200,000) the band claim to have received very little royalties and this may have accentuated a darker worldview which while not quite dystopian, stood in stark contrast to the vacuous euphoria of the ‘flower power’ generation. Balaklava which appeared a year later, received Rolling Stone magazine’s dreaded , it’s lowest possible rating. But in the 1960s Rolling Stone frequently got it badly wrong. Once again the album featured some apocalyptic artwork, this time Pieter Bruegel’s The Triumph of Death, and presented a uniquely harrowing vision of the horrors of war, delineated by Rapp’s (Winston inspired!) hallucinatory and surrealistic poetry. The album is bookended by two historical recordings: the first, by Trumpeter Landfrey, who sounded the bugle at the beginning of the ‘Charge of the Light Brigade’ at the Battle of Balaklava during the Crimean War; after the second, a barely audible recording of the voice of Florence Nightingale, we hear a tape loop of the whole album rewind to the beginning, surely a commentary on the perennially rapacious nature of the human species, forever embroiled in military conflict, captured at the precise moment when the ugly truth about America’s involvement Vietnam was gradually emerging. ‘Images of April’ has a simple swooning bass line but replete with birdsong, flutes, echoed voice, and introducing the intriguing ‘swinehorn’ of Lane Lederer, is the archetype for the album’s peculiar sound.